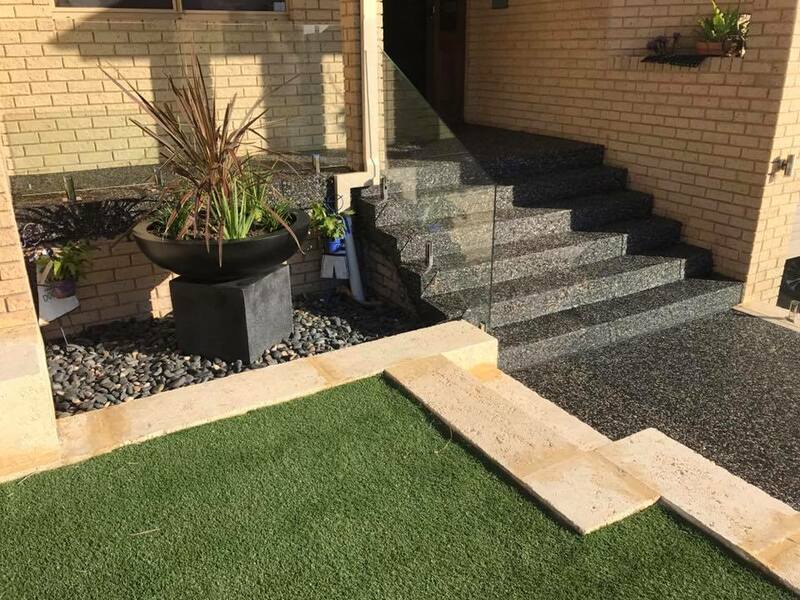 We are a local concrete company in the southern suburbs of WA providing exposed aggregate Perth services and high-quality concrete paving. We pride ourselves on our professionalism, friendliness and excellent workmanship. We understand that you don’t want to trust your property to just anyone. Absolute Scapes is a local business located in Yangebup, WA. We specialize in different types of decorative concrete paving that have helped our customers to enhance the beauty of their residential properties as well as increase its value. Our concrete pavers provide the highest-quality that WA has to offer, providing durability on any texture for your surfaces. Whether you are looking to enhance your pool, footpaths, sidewalk, courtyards, or concrete driveway, give us a call today. Our exposed aggregate Perth team are always ready to assist you. For the last 15 years, our family owned and run business has earned the trust of many homeowners and business owners in Western Australia. At Absolute Scapes, we are a team of insured, licensed and bonded pavers who believe in getting the job done right on time and on budget. We value our customers, and our staff is ready to respond to your queries and offer exceptional workmanship from the start to the end of each project. Our customers usually seek concrete services that will both beautify their homes and enhance the value of their property. Installing a new driveway, alfresco or a lead walk to your front door is one of the most effective ways to enhance the beauty and the value of your residential property. 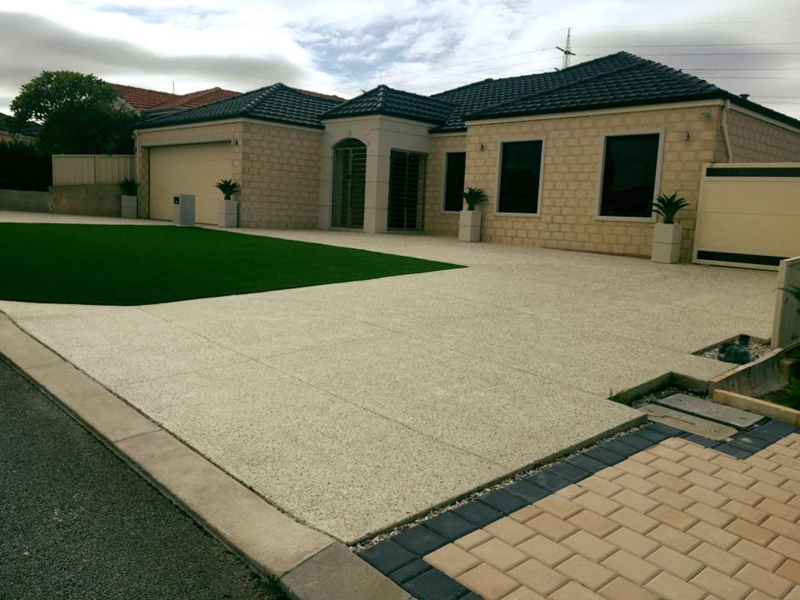 With almost two decades of expertise in Perth exposed aggregate colours, Absolute Scapes has taken driveway installation and resurfacing to another level. Advanced equipment and high-quality materials enable us to deliver unmatched results. We ensure that every driveway is unique, structurally solid and appealing to the eyes. 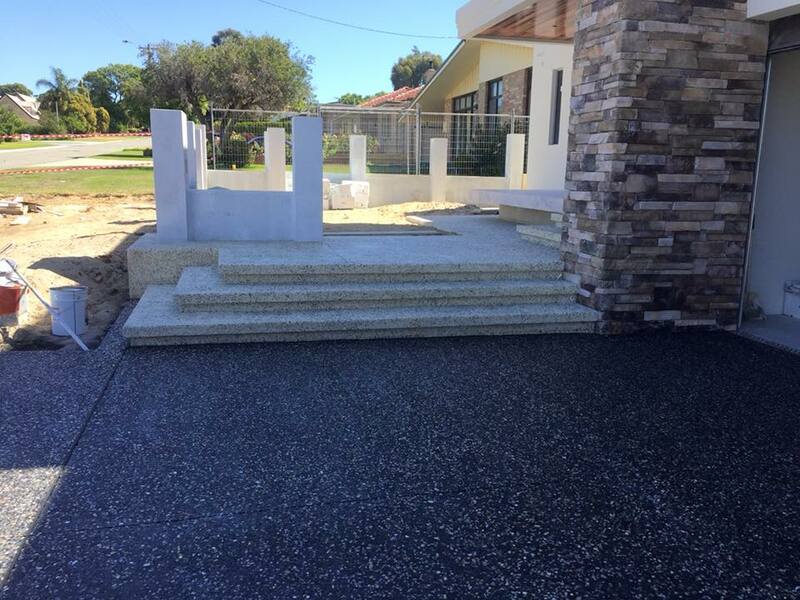 Our exposed aggregate Perth experts also ensure that the concrete installation is completed within the quoted budget. Let Absolute Scapes be your concrete contractor when you need help with patios and steps. We are an experienced concreting company serving WA residents and the surrounding areas. We use premium products and modern designs for patios and steps that will make them stand out from the crowd. 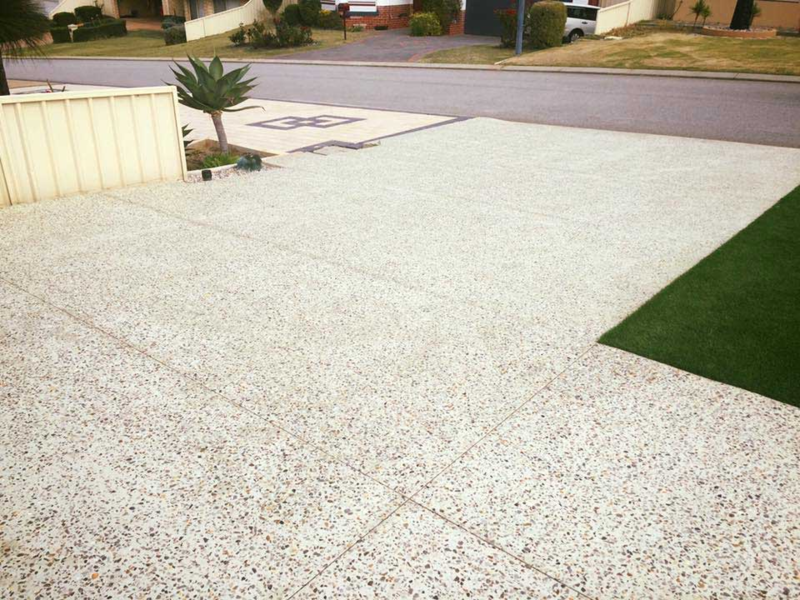 Contact Perth's premier concreter today for an exposed aggregate concrete finish & washed concrete. Exposed aggregate is a concrete finish where the exposed surface reveals the textures of stones in cement like pebbles, shells, silicate and crushed quarry stone. After many years of weather-related wear and tear, walkways begin to crack, settle and shift, causing them to lose their aesthetic value and cause accidents. At Absolute Scapes, we know that installing a new walkway or replacing an old one can be a significant boost to the value of your home. You will be surprised by the many options that we have for your walkways, view our colour range here! 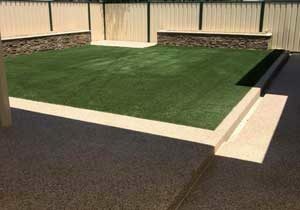 Residents in WA and surrounding areas can now contact Absolute Scapes for all their masonry concrete services and needs. We are experts in finishes such as polished & honed concrete Perth, liquid limestone, decorative concrete Perth, coloured concrete, grey concrete and more. As professional pavers, we can help in building a patio for your home, concrete driveway, walkways, alfresco, renovations, swimming concrete pools areas, spa surrounds and floors. We have an extensive understanding of local zoning laws and regulations, and we are also flexible regarding scheduling and price. Give our exposed aggregate Perth experts a call today or contact us for an obligation free quote. Whether you are looking for new concrete floors or a concrete patio, our expert team provides only the best service ensuring each concrete slab displays a stain look with each sealer used. We specialise in sealing and curing and understand that stamped concrete should not display any signs of wear and tear provided the correct staining is used. Our poured concrete sealer can be used for pool decks, your garage floor, concrete walkway, and any type of concrete floor to ensure a high-quality exposed aggregate finish. As part of our concrete finishes, polished concrete is one of the main overlays we use, displaying a wet look and surface finish. Whatever design you are opting for, whether that be colored concrete, architectural concrete or stained concrete, our concrete products are here to meet your needs. If your driveway paving or concrete pool deck requires a professional paver, we're here to help with our ready mix concrete color & high gloss materials. 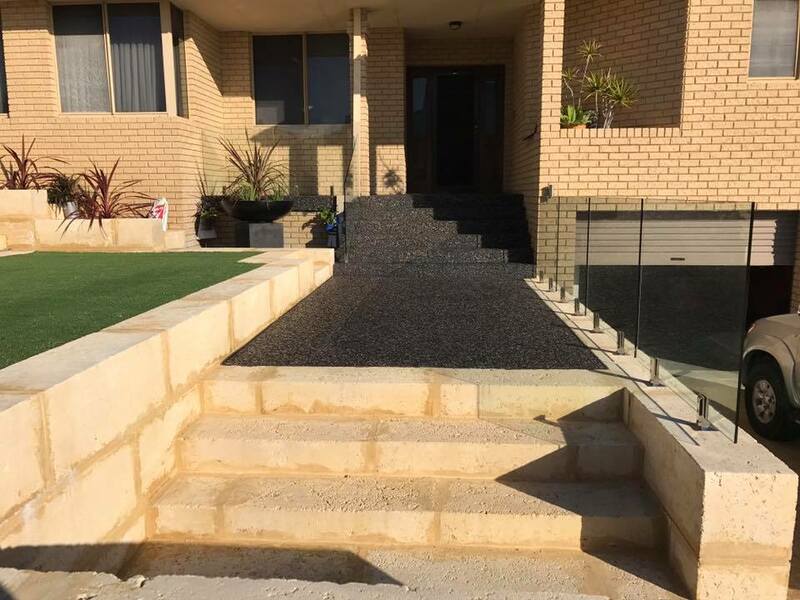 In addition to providing a professional service in Perth, our concrete repair experts have assisted in numerous residential projects ensuring the end result is a success. Our well-equipped team specialises in exposed concrete and understand that a concrete resurfacing job will require the use of a trowel, broom and more. We provide various types of finishes ensuring you the right concrete overlay is used properly whether that be through flatwork or retarder if necessary. Each concrete mix has been carefully compacted and considered for each job. Contact us today, your concrete contractors for exposed aggregate Perth services. Need qualified professionals providing concrete paving in Perth on time & on budget?